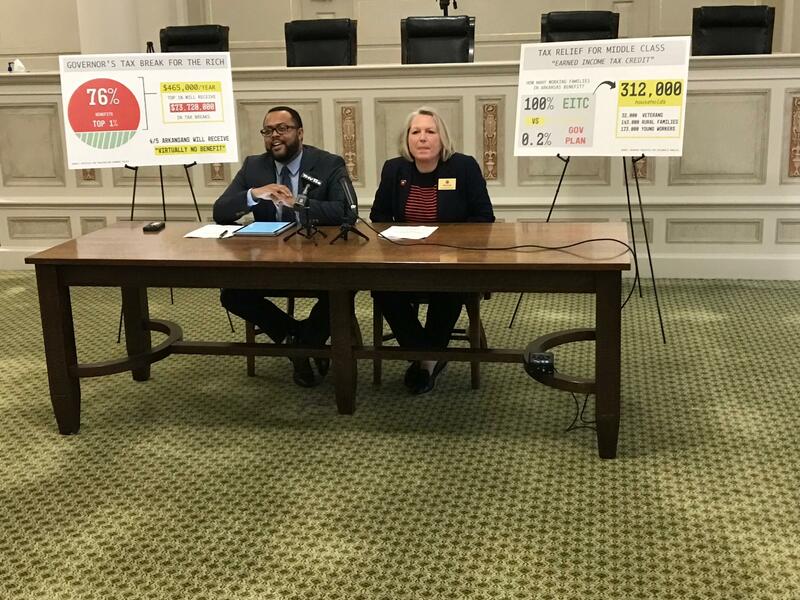 Arkansas House Minority Leader Charles Blake and Representative Tippi McCollough present a tax plan which would introduce earned income tax credits to the state. Providing tax cuts for low- and middle-income workers in Arkansas is the goal of a new tax plan released by leaders in the state’s Democratic Party. Speaking at the Capitol, House Minority Leader Charles Blake said an earned income tax credit will benefit more Arkansans than the current plan being proposed by Governor Asa Hutchinson. State democrats claim an earned income tax credit would provide relief to 300,000 working families. Representative Tippi McCollough filed “The Working Families Tax Relief Act” Friday. If passed, Arkansas would join 26 other states in having some form of earned income tax credit. “This proposal would help a married family with three kids making up to $54,884 a year, or a single mother of one earning up to $40,320 a year. These are the people we should be giving tax relief to,” McCollough said. Governor Hutchinson’s $97 million tax proposal has been criticized for favoring the wealthiest earners because it drops the tax rate for those earning more than $456,000 a year. Hutchinson’s proposal failed to get the necessary votes early last week, but then passed the Senate a day later.